There are several fun (and simple) things you can do with the drop waist dress pattern. One is to embellish the front. Pintucks, small stitched down pleats, on the bodice, are one way to change the pattern up. Since doll dresses, especially their bodices, are small, it is easier to sew the tucks in the fabric before cutting out the bodice. Cut a rectangle of fabric slightly taller than your bodice and at least three inches wider. Fold it in half vertically to mark the middle. You will want to keep your pintucks centered. I use a ruled piece of paper to mark where the pintuck folds will be (I will provide this in the newsletter patterns). It's kind of a pintuck cheat. Place the ruled piece of paper on your fabric. Center it. Cut small snips at the end of each line on your cheat sheet. This is for marking where to fold and iron. Fold and iron along each line making sure all of your folds are on the same side of your fabric. After pressing the folds, you will stitch each one with a contrasting thread a tiny bit in from the fold. I used the interior edge of my presser foot as my guide for keeping the pintucks straight and even. See arrow. Using your presser foot to keep the pintucks straight and even. Repeat this for all six of the pleats, paying attention to making sure they are coming out all on the same side of the fabric. When you are done, press the pleats so they are all facing out from the center and then staystitch across the top of the fabric so they stay pressed in the correct direction while you cut out your bodice. Now that your bodice fabric with tucks is made, you are ready to cut out the bodice. Since I use freezer paper, I ironed mine on and cut. Pins also will work. Make sure your pleats are centered underneath before cutting. Next sew your dress together following the dropwaist instructions. I did this one without the ruffle sleeves and I machine hemmed it with contrasting thread to match the pintucks. For this pattern, the drop waist pattern and all of the other patterns in the series, subscribe to the Phoebe and Egg newsletter. Sign up is below. Sign up for the newsletter and receive a set of the base patterns and receive patterns as they come out, plus useful links and more. I love Instagram. Through Instagram I have stumbled upon a lot of cool makers, including the authors: Georgia Vaux and Louise Scott-Smith. Their book, aptly named, "I CAN MAKE DOLLS" CLOTHES" is adorable. The pair have worked on other projects togther in the past and said this book was the perfect combination of all of their interests: fashion, design, craft, and a shared aesthetic and love of the handmade. I have always thought of sewing for a Barbie sized doll challenging, but this book makes it easy...for even a six year old. The graphics are so fun and simple, if your child can read, they can follow the instructions. But the book isn't just designed for kinds, adults can use it too. The clothes are better than the bought Barbie clothes. 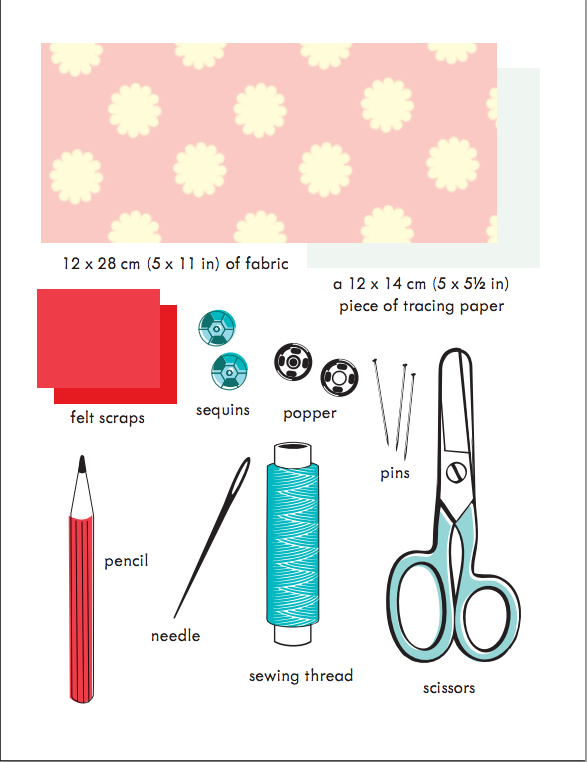 The book helps a child make simple patterns that they can alter, enhance and easily sew. Don't worry about wobbly stitches, that's part of the charm. If you can't hem the cut edges, or get a grown up to do it, nail varnishing will keep them from fraying. Tommorrw's post I will be giving away one copy of this book and fabric, trim and velcro to make five dresses. My last tutorial was for a Retro pointy Collared Dress. So I thought I'd stick with the retro theme and add a bib front dress tutorial. The bib front can easily be added to a number of dress styles. I added it to a puff sleeved dress. Cut out dress, collar, sleeves, lining. I have been using cotton lawn for my linings. It is a lighter weight cotton whic reduces bulk in the lining seams. This especially helps in the neckline collar area. There are several ways to treat the edges of a bib collar. In this first tutorial I am using one layer of fabric for the bib and trimming it with rick rack. So choose a trim. Medium sized rick rack or lace both will work well. Small ricj rack is tricky and big may not bend around the corners so easily. Sew Rick rack to the bib front. This is a two step process. Step one is sewing it about 1/4 inc in around the edge. After Step 1 the bib should look like this. Next fold over the edge so the outer half of your rick rack is underneath and stitch. Try to stitch on top of your first set of stitches. Pin collar to the dress matching up neckline edges. Stitch down, stitching over your first set of stitches. Press. Add collar and sleeves. See links above if you need to revisit those tutorials. Or visit the doll dressmaking page with all of them. Add buttons. The pattern pieces for this dress and all others are available through the Phoebe&Egg newsletter. When you sign up you will automatically receive the base pattern set in 4 sizes. Remember the raglan peasant blouse tutorial a few weeks ago? A very easy pattern. Now this pattern can easily be made into a dress. Same instructions, it's just a matter of lengthening one pattern piece. I've done it for you and will include a download in my upcoming newsletter. Sign up form is down below. To make sure you receive all pattern pieces and tips, sign up for my newsletter. When you sign up you automatically receive all of the pattern pieces to date. I love Waldorf dolls, but I do not own any. So when I started the Doll Dressmaking Series, I designed the 16 inch Waldorf Doll patterns from the measurements of a local dollmaker who makes lovely Waldorfs. But doll sizes vary, even in mass produced plastic dolls, but especially in Waldorfs. The good news is with a soft doll, arms, heads and waists can be squeezed in a bit to make things work. But if things are too big they drape or worse still, fall off. So I asked for feedback from those sewing for Waldorf dolls and I was grateful to here from Andrea, all of the way over in Germany. She had been using my patterns to sew dresses for her beautiful Waldorf dolls and yes, she had made a few adjustments. 1. Overall she made the bodice/dress more narrow at the side seams of both the front and back. 2. She also moved the front center foldline in a bit to make the front narrower. 3. She added a bit to the back center edge to make more of an overlap where the dress snaps closed. 4. She made the neckline a bit larger. Above I have drawn on the original pattern to show you approximately what Andrea did. These type of adjustments can be done to any bodice/dress pattern to make it fit a specific doll better. Some times it takes a few tries on how far to take in before you get the exact right fit. When you find it, be sure to draw on your pattern or a copy of your pattern, so you can repeat what you did. I will include a link to the PDF pattern for Andrea's adjustment in next week's newsletter. You can sign up here, and receive all future pattern pieces, plus tips, tutorials, finds and inspiration. Raglan peasant tops are classic. They are also simple to make. The main skill involved is knowing how to thread elastic through a casing. And I explained that in an earlier post here. Cut out two sleeve pieces and two body pieces. Sew the two sleeves to either side of one of the body pieces. Sew the remaining body piece to one of the raw sleeve edges. Sew a narrow machine hem along the neckline and bottoms of the two sleeves. By narrow turn over no more than a 1/4 inch. Make elastic casings for threading your elastic. These should be about 3/8 inch if your elastic is 1/4 inch. The casing are made by folding your fabric towards the wrong side (sorry i used fabric that does not have two distinct sides for this tutorial). Cut elastic for neckline and sleeves. For American Girl dolls and Waldorf: Two 6 inch pieces for sleeves and one 14 inch piece for neckline..
Thread elastic through casings, as described in my puffy sleeve tutorial. I suggest draping the shirt on your doll to determine how "gathered" you want the neck. Remember it stretches, but you also don't want it too tight. Too tight looks awkward and is hard to get over the dolls feet or her head. Sew side seam from bottom of top to the bottom of the sleeve, on each side. Hem or trim bottom of the blouse. I think this style is perfect for all sorts of trim. Form for the pattern below. Phoebe's is ready. AG and Waldorf should be ready by Saturday. Pleats are classic. And used in a doll dress they can be classic cute. This first tutorial is for a simple center pleat. At the end of the email, I have included a form for requesting the pattern for this, which includes the bodice and skirt with a center pleat. Start with making the bodice, which is made like the beginning of the reversible dress or dress with a bodice. But do not sew up the side seams! Do not cut the pleat line, just make small snips at either end to mark it, or mark the ends with pencil. Next you will make the center front pleat. 1. Fold the front skirt piece in half, with the right side in the fold, or wrong side out. Lightly iron. 2 and 3. Use very large basting stitches to stitch from the nick and the top of the skirt to the nick at the bottom. 4. Your skirt should look like this. Next you want to iron the pleat and "set" it. or get it to stay. Use steam and the cotton setting. Press pleat from the back side as shown. Flip over, press some more. When you feel like your pleat is stable, you can take out the basting stitches. Leave a few at the top to hold the pleat together while you stitch it to the bodice. The last few steps will seem familiar. 1. Finish center edges of the skirt back pieces. 2. Sew skirt front and backs to their appropriate bodice pieces. 4. Sew side seams and hem. I added some bias trim along the waist seam. I have finished drawing the Phoebe pattern in Illustrator. I hope to have the other two done by the end of the weekend. Form for requesting the patterns is below. Subscribe to our newsletter to receive all of the patterns. There are a lot of easy ways to change up a doll dress. This trick can be used in a number of sewing situations, but I'll start with showing you how on the reversible dress. After you see how easy it is, you may want to try it with sleeves or a collar. You will see this is an excellent way to use scraps of fabric. Start with two pieces of fabric that you like together. Sew the two pieces length wise. Your goal is to create a piece of fabric large enough to cut the outside of the reversible dress pattern from. Once you've sen them together, you may want to add trim, but you don't have to. Sew trim along the seam you just created. Then lay your pattern out on your piece of fabric and cut. Next cut a lining and proceed to make the reversible dress. As I mentioned earlier this can be done with sleeves or a collar too.